ESSENTIA ONE is one of the most advanced developed project that we have seen since we started to review ICOs. Instead of issuing an ICO whilst being in the Alpha or Beta phase, Essentia One already has a fully functional product that is integrated with various dApps such as Ethereum, Status Storj and others. Besides that, they have an outstanding team that has shown to be able to produce results. What if you truly would be able to control your own data and identity, if you would be able to use the same credentials for every service or site you use without ever having to think about which user name (or password) you used for which site? Meet Essentia One, their product aims to bring back identity and data ownership to where it belongs..The user. Essentia One was founded by Mirco Mongiardino, Matteo Gianpietro Zago, and Vladimir Holubovych, who all have a strong affinity with the ICT industry. The synergy between the three resulted in the startup of several highly successful businesses which provides jobs for over 50 employees across three different countries, generating millions in yearly revenue. But, it wasn’t until they met with GRX0(their mysterious and privacy conscious blockchain and architecture lead)in early 2017, that their vision and idea (of building a modular decentralized framework to manage identities),really came together. When you think of Essentia it is important to reflect upon the current state of today’s web. If you look at the web today, you will notice that the web is not decentralized at all in the way Tim Berners Lee (creator of the concept of the World Wide Web), envisioned. The Core part of Tim’s vision of the World Wide Web was the decentralization of its structure. We have lost control of our personal data and identities to monopolists like Google and Facebook. We have all seen or experienced the consequences of centralization and monopolies, whether through theft of our personal data, or through the generation of advanced psychological profiles(harvested from our data), for the sole purpose to manipulate ourideas and opinions. Data no longer belongs to the individual but is treated as a commodity that is freely traded by insecure corporations. Essentia One is created to empower users by handing them back control over their personal digital identities. Essentia One provides a gateway to decentralized resources and, through them, traditional internet services, while also having exclusive, full control, over their identity, digital life and data. Essentia fills the solution gap of the current landscape and makes available a complete and versatile multi-chain framework. Its primary goal is to empower users with a toolset of decentralized solutions which seamlessly integrate with on-chain or off-chain systems, services or resources. Essentia protects users’ privacy, needs and security by developing a bleeding-edge and user-friendly framework. The Essentia framework gives full and granular control to users and enables them to act anonymously, pseudo-anonymously or publicly. Users can decide whether or not to share their data in part or in full and when, how and where that data is shared. Beyond the ID system and its connected data and metadata tools or services, Essentia also provides secure, trustable and decentralized software environment solutions that can run on all major OSs and hardware. Essentia is the connective tissue between the user, decentralized resources and traditional systems. It enables anyone, anywhere to take advantage in full of current and future technologies. The Essentia framework is the missing link that finally enables a trustable, simple and powerful way to interact with decentralized systems and everything that can be connected with them, whether software or hardware. 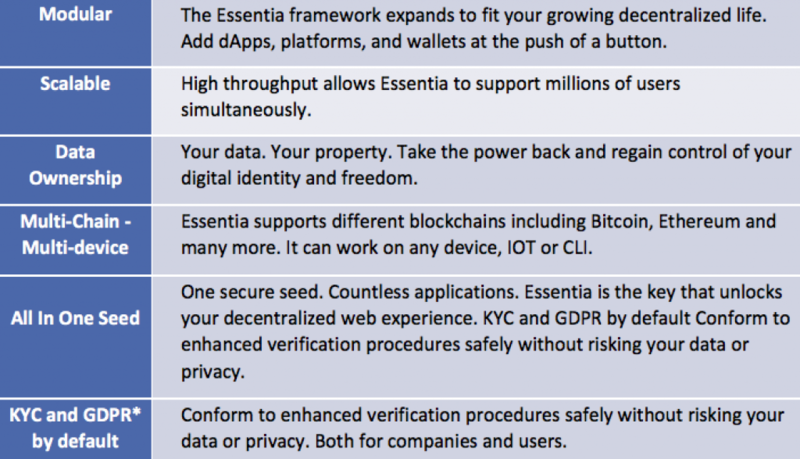 What are ESSENTIA ONE’s core features? What are Essentia One’s core Use Cases? Decentralized Password less Logins:Users can use eLogin to seamlessly login to websites and dApps, without the use of insecure passwords. KYC Registrations: ‘Know Your Customer’ compliance services can seamlessly accept new clients and securely store their data, decentralized. GDPR Compliance: Companies in need of GDPR compliance solutions can use Essentia. Users can request the removal of their data, an action which is publicly verifiable using proof of on-chain transaction. Oracles for Smart Contracts:Insurance companies, financial services and banks can interact and trigger asset seizure, provided certain conditions are met, without relying on intermediaries. How does Essentia One work? Everything gets included in one single super compatible seed, which can then be used to recover the decentralized user at any time, from anywhere, on any device connected to the internet – completely or partially, by requesting just the modules, data and functionalities needed. eLogin:Log in to all your decentralized applications securely and with just a few clicks. eLogin uses simple message verification to log in to services and frees you from creating and remembering passwords.dApps supported: Aragon, IOTA, OmiseGo, Status, NEO, Ethereum. Decentralized Exchange:Trade your tokens on the decentralized EtherDelta exchange through the Essentia One app. Current exchange supported: Etherdelta. The ESSENTIA ONEproject features a team of 34 full time members and are actively recruiting new people as we speak. The core team members with all have proven track records of entrepreneurial and technical skills. We will only list the most important ones. Matteo is an advisor in blockchain-related startupssince 2014. His career in business started 8 years ago by creating his first project with a budget of € 10. He turned that into a real business which serves Fortune 500 companies like: Uber, Alphabet, Facebook, Tencent. He’s the author of the Facebook Bible and the Twitter Marketing Guide, bothbest-selling books on Amazon. Mirco is a web entrepreneur with strong experience in building tech products for data analysis, data driven marketing and media acquisition. He discovered Bitcoin in 2013 and fell in love with the revolution ever since. Starting building companies from his bedroom since he was 16, Mirco now manages more than 40 people spread across seven countries, with offices in Amsterdam, Lviv and Dubai. Vladimir’s first step in business started when he was 19. He created advertising campaigns for Italian companies initially and for international ones later. His ideas helped the largest Italian public television stations and world-famous political figures successfully execute their online marketing strategy. Vladimir took a great interest in blockchain in 2014. He invested in several startups, aided by his extensive experience in online marketing strategy. Essentia One has put together a specialized unit of advisors to guide the growth of the business. Each person in their advisory team is a technology/blockchain heavyweight. Tokens distributed to the team and developers will be locked for 18 months with a 6 month cliff. Depending on each case, tokens distributed to advisors will be locked between 6 months and 1 year. For more information about the use and functions of the ESS token click this link: technical documentation. Team:ESSENTIA ONE is led by an expert team that have shown to be able to develop (and execute) successful projects. Furthermore, the team has been together for some time, this is a huge advantage because the team knows exactly what to expect of each other and know where their competencies lie. Interoperability:The ESSENTIA ONE network allows for seamless integration on multiple blockchains and with multiple protocols. It is designed to enable, and allow, cross-chain operations and transaction while also being able to integrate resources from different blockchains under the same secure environment. Compliant with GDPR: The European Union has forged new privacy rules which are drafted up in the ‘General Data Protection Regulation’. It seeks to give people more control over how organizations use their data and introduced hefty penalties for companies who do not comply with these rules. These new rules will come into effect on 25 May 2018. Easy to use interface:Their interface allows for managing different blockchain assets with one password through an easy to use interface. This will certainly attract the less tech-savvy users which,in return, can speed up mainstream adoption significantly. Core Technology Risks:Their solution is built with core technologies that are immature and unproven, if those core technologies do not perform according to their needs or expectations, they may be required to change the specifications or to reduce or eliminate features on the platform. Lack of Market Penetration: This project depends on attracting users and third parties providing services to Essentia One at a level sufficient to become (or remain) useful or viable. Any such lack of use or interest could negatively affect the development of Essentia One and therefore the value Essentia One and their token ESS. Regulatory Risks:Because laws are not yet fully on track with blockchain technology, there is a risk that Essentia One needs to make substantial modifications to their token dynamics.It is not known if, when, or to what degree different jurisdictions will interpret existing laws and regulations or adopt new laws and regulations that could adversely affect them. There is a great need for solutions that provide privacy and data guarantees because of all the abuse happening with our private data today. There are many examples that prove that centralized monopolist systems, as we know them today, are only in the interest of the companies who gain profits by selling our data to the highest bidder. Besides the fact that our private data is being sold,centralized systems are also vulnerable for hacks and attacks. Proof of these abuses can be found here and here. Essentia One is also making blockchain technology more user friendly, up till now users had to install different wallets and use different passwords and seeds to access all these services. With Essentia One you can do all this from one unified interface. I am sure that when people try their product and see how easy it is to manage all assets from one interface, they will certainly start using it. I love this project and will certainly participate in their ICO!